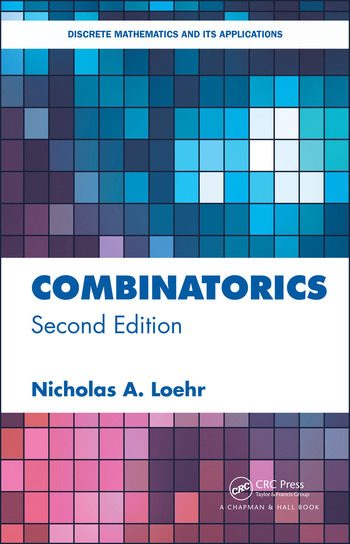 Combinatorics, Second Edition is a well-rounded, general introduction to the subjects of enumerative, bijective, and algebraic combinatorics. The textbook emphasizes bijective proofs, which provide elegant solutions to counting problems by setting up one-to-one correspondences between two sets of combinatorial objects. The author has written the textbook to be accessible to readers without any prior background in abstract algebra or combinatorics. Part I of the second edition develops an array of mathematical tools to solve counting problems: basic counting rules, recursions, inclusion-exclusion techniques, generating functions, bijective proofs, and linear algebraic methods. These tools are used to analyze combinatorial structures such as words, permutations, subsets, functions, graphs, trees, lattice paths, and much more. Part II cover topics in algebraic combinatorics including group actions, permutation statistics, symmetric functions, and tableau combinatorics. This edition provides greater coverage of the use of ordinary and exponential generating functions as a problem-solving tool. Along with two new chapters, several new sections, and improved exposition throughout, the textbook is brimming with many examples and exercises of various levels of difficulty. PART 1: ENUMERATION. Chapter 1: Basic Counting; Chapter 2: Combinatorial Identities and Recursions; Chapter 3: Counting Problems in Graph Theory; Chapter 4: Inclusion-Exclusion and Related Techniques; New Chapter 5: Generating Functions; Chapter 6: Ranking, Unranking, and Successor Algorithms; PART 2: ALGEBRAIC COMBINATORICS; Chapter 7: Permutation Statistics and q-Analogues; Chapter 8: Permutations and Group Actions; Chapter 9: Tableaux and Symmetric Polynomials. Chapter 10: Abaci and Antisymmetric Polynomials; Chapter 11: Additional Topics. New Appendix: Background in Abstract Algebra. Nicholas Loehr is an associate professor of mathematics at Virginia Technical University.